But, don’t take our word for it; listen as Brandis Friedman of WTTW Chicago reports on "Tiny plastic microbeads pile up into a problem for the Great Lakes". But what is the real danger of microplastics? Not enough research has been done to truly get a grasp on their widespread effects, but many concerning revelations have been made. Many plastics are manufactured along with certain additives like dyes and plasticizers. Degradation of larger plastics into microplastics can expose these often harmful chemicals to the environment. Besides those pollutants the plastic is made with, microplastics have been seen to have an increased affinity for harmful persistent organic pollutants (POPs) that they encounter in treatment plants and the marine environment. One study has shown that a polychlorinated biphenyl (a POP) levels were 106 times higher on polypropylene pellets than in the surrounding seawater.6 To compound the problem, the plastics are likely to release the POPs again in the presence of high levels of organic material, as found in the digestive tract of animals, for instance, a phenomenon that could be more intense for less hydrophobic polymers such as those from synthetic clothing.7 This means that microplastics can concentrate the POPs in the ocean, and when the microplastics are ingested by plankton or larger animals and those animals are eaten by others, the microplastics release the concentrated pollutants to the animals’ tissues. This intensified bioaccumulation of harmful chemicals affects not only marine life, but everything that eats marine life, including humans. As was mentioned by David St. Pierre in the video above, there is currently no cost effective way to remove microplastics from the effluent at wastewater treatment plants. Our project works to solve this problem through the creation of a biofilter to remove microplastics. It has two unique parts which each tackle a different aspect of the filter. On the one hand, we are attempting to create a strain of E. coli which will form a biofilm along the surfaces of a filter to increase the concentration of bacteria within the filter and minimize the amount of bacteria lost in the flow-through. The second aspect of our project is to have those E. coli secrete a nylon degrading enzyme into the water which will degrade the microplastics passing through into their constituent monomers and prevent the polymer from leaving the treatment plant where it can wreak havoc. The biofilm formation portion of our project focuses on the overproduction of the pgaABCD operon gene products in order to increase biofilm formation. 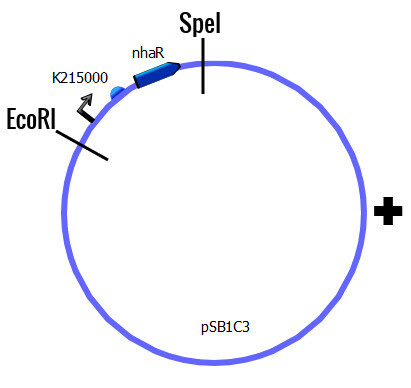 This is done through two pathways—the insertion of a plasmid containing the entire operon into the cell, or the insertion of a plasmid containing the transcriptional activator ''NhaR''. NhaR is a DNA binding protein within the LysR family of transcriptional regulators which has been shown to be necessary for transcription of the pgaABCD operon.12 NhaR is transcribed in unaltered E. coli in the presence of monovalent cations and alkaline conditions, leading to biofilm production under these stressful conditions.13 Expression of NhaR under a constitutive promoter on a plasmid enables us to create a biofilm under all conditions within our filter. The adhesive nature of this biofilm will then prevent our cells from being swept away in the flow of the water through the filter, enabling long term functionality within a water treatment plant. The second enzyme used was Nylon Hydrolase (NylC), an enzyme from Arthrobacter sp. that has been shown to degrade oligomers of 6-aminohexanoate, the monomer for nylon-6.16 The enzyme was originally discovered in bacteria living in the wastewater from a nylon-6 factory and apparently directly evolved to break down nylon. 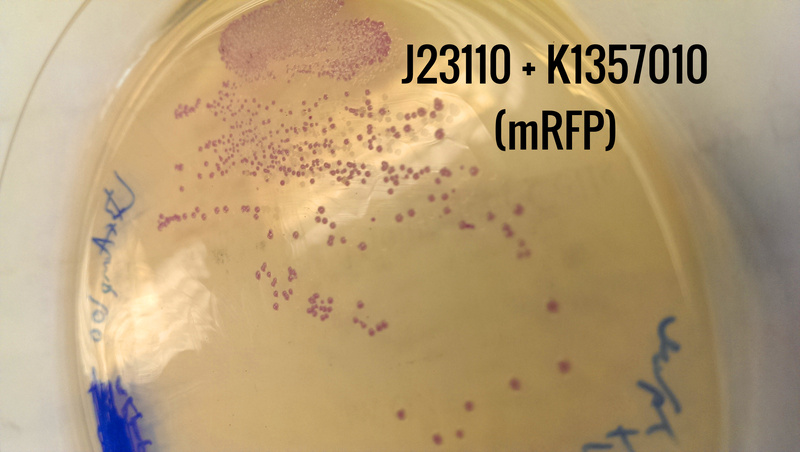 Both the Manganese Peroxidase and Nylon Hydrolase genes were paired with a secretion tag so that, when added to the PGA overproducing strain of E. coli, the cells will be ready to be tested in the bio-filter. If effective, additional strains using existing BioBricks to degrade other plastic types could be created and added to the filter to make it chimera of cell lines enabling a wide range of microplastics to be degraded before entering the ecosystem. A BioBrick of the nhaR gene in E.coli bacteria is supposed to increase their biofilm formation. When expressed, the nhaR gene acts as a transcriptional regulator of the pga operon. The pga operon increases cell-cell adhesion when expressed. This increased cell-cell adhesion will increase the biofilm formation in the bacteria. Therefore, the aim of the crystal violet assay is to quantify the amount of biofilm produced by these bacteria. Mechanism of the assay: Crystal violet binds to polysaccharides of the biofilm matrix. By measuring the binding to adhering biofilm, the amount of biofilm produced can be quantified. A stock solution of crystal violet is incubated with the culture, the supernatant is removed, bound crystal violet is mobilised with an acetic acid solution and the absorption is determined. The absorption values determine the amount of biofilm present in the culture at the time of staining. 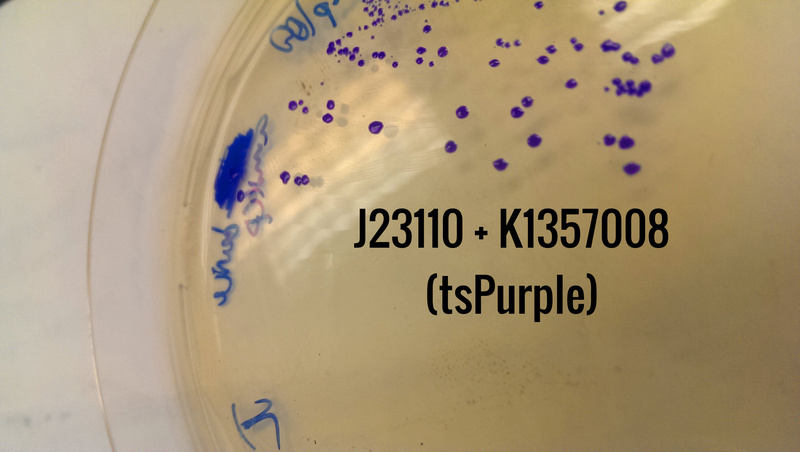 Crystal violet trials were conducted with E.coli BL 21 (DE3) cultures grown with both LB and soybroth media on 96 well plates. The 96 well plates’ columns were divided with different concentrations of IPTG on the control (circular pSB1C3, and on the nhaR BioBrick with the IPTG inducible promoter. No IPTG was added to the nhaR BioBrick with the constitutive promoter. Chloramphenicol was added to all samples. Strain of E. coli used: BL-21. Amount of culture: 100 µL. Amount of Chloramphenicol 20: .01 µL per well. nhaR with IPTG inducible promoter vs. nhaR with constitutive promoter. 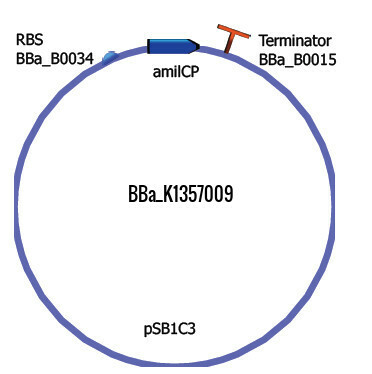 The IPTG inducible promoter used was BBa_K215000 while the constitutive promoter used was BBa_J23100. Media used: LB vs Soybroth. NC: nhaR BioBrick with constitutive promoter, with 0 µM IPTG. Figure 2 A comparison of the OD550 absorbances of the control (circular pSB1C3) and the nhaR BioBrick with the constitutuve promoter at 120 hours. The nhaR BioBrick with the constitutive promoter-NC in Figure 1 showed a 33% increase in absorbance compared to the circular pSB1C3. However, we were not able to replicate the results in further trials. This failure to replicate results can be attributed to experimental inconsistencies in later trials. Figure 3 The comparison of absorbance at OD 610 between nhaR BioBrick with the constitutive promoter and the control at various times. The biofilm formation rate appears to be following a similar pattern for both the nhaR BioBrick and for the control. However, the nhaR BioBrick has the highest biofilm formation rate between 24 and 48 hours. 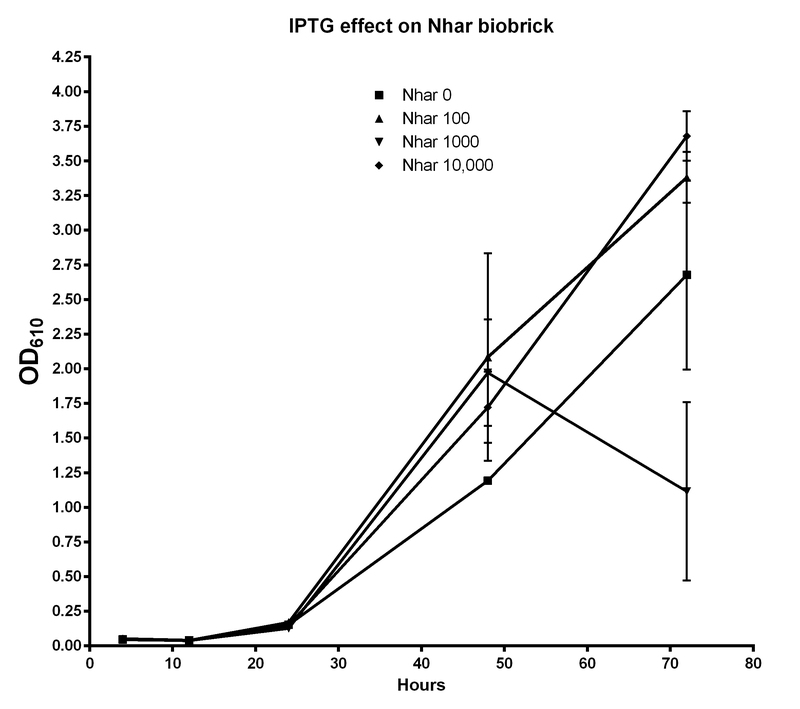 Figure 4 The comparison of absorbance between nhaR Biobrick with different concentrations of IPTG. The concentrations of IPTG used were: 0,100, 1000, 10,000 μM..
An increase in the IPTG concentration does not seem to have an effect on the growth rate of the nhaR BioBrick. A leaky IPTG inducible promoter can be a reason for this behavior. There is also a possibility of the promoter malfunctioning. nhaR BioBrick with a constitutive promoter has been used because of this possibility. 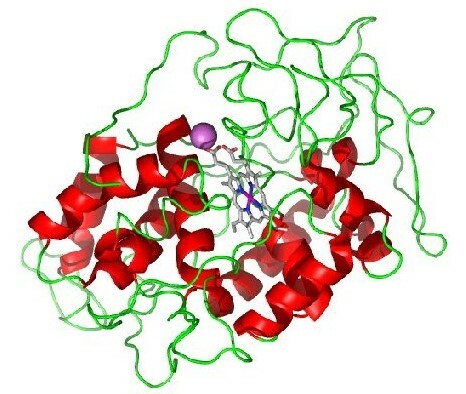 Manganese peroxidase is an enzyme from the fungus, Phanerochaete chrysosporium. In this fungus, commonly known as white rot fungus, this enzyme aids in lignin degradation. Its enzymatic activity has been found to be optimal near a pH of 4.5 and at a temperature of 32C. Syringaldazine (4-Hydroxy-3,5-dimethoxybenzaldehyde azine) can be used as an indicator of oxidative activity for laccases and peroxidases. 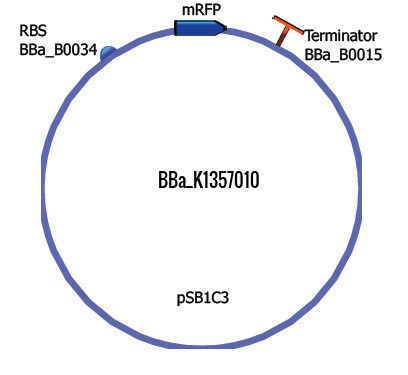 The general conditions outlined by the protocol given on the Sigma Aldrich website were used in order to preliminarily assess if the mnP coding sequence encoded by the BBa_K1357001 on the compound BioBrick BBa_ K1357006 was producing MnP protein. The operating pH for this assay is 6.5 and hence fell far outside the pH optimum for the MnP protein. Even so, BioBrick BBa_ K1357006 showed an observable difference in oxidative activity (see Figure 1 below). Figure 1 - Results from the Syringaldazine Assay. 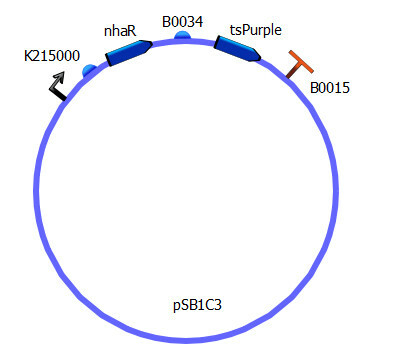 BL-21 E.coli with circularized pSB1C3 plasmid acted as controls. 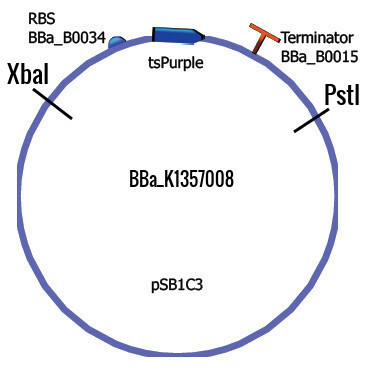 The samples containing BBa_ K1357006 plasmid were also BL-21 E.coli. The procedure was run over 60 minutes and performed on 6 identical samples of control and BBa_ K1357006. The average of the absorbances at 530 nm are plotted above along with error bars constructed from standard errors of the mean values. In order to assess if BBa_ K1357006 would be able to be used as a means of degrading nylon 6,6 micro and macro plastics, our team developed a nylon degradation assay. Samples wit approximate diameters of 0.5mm were submersed in 3 mL of growth medium with BL-21 E. coli cells with BBa_ K1357006 and incubated in a shaker at 32℃ and 160 rpm for 1 to 3 days. The growth medium was supplemented with manganese sulphate as well as a buffered solution comprised of sodium acetate and acetic acid so as to lower and maintain the pH of the mixture to 4.5 for the duration of the experiment. The samples were massed before and after incubation, but no noticeable change in mass was observed. Scanning electron microscopy (SEM) was used in order to visualize the surfaces of treated and untreated samples of Nylon 6,6. The results from the SEM imaging showed physical deformations on the surfaces of samples treated with BL-21 E. coli cells with BBa_ K1357006 that were not evident in any of the untreated samples or controls that were shaken in media without cells present. These physical deformations were not consistent in their appearances. Further experimentation before the 2014 jamboree is intended to explore the effects of long term exposure, to improve the consistency of the effect, establish a quantitative means of measuring the effect of our modified bacteria. NylC is a nylon hydrolase derived from Flavobacterium sp. K172 that digests the internal amide bonds in nylon 6. It hydrolyzes the oligomer form of nylon 6 and liberates primary amino groups as the oligomer is broken down into monomer 1. These free amino groups can be detected by trinitrobenzene sulfonic acid, which can react with primary amino groups to form orange-colored products whose absorbance is at 335-345nm2. The nylC Biobrick (BBa_K1357007) is introduced into E. coli BL-21 and the bacteria are cultured for approximately 20 hours. After centrifugation, the cell pellets are lysed by lysozyme and the resultant lysate which contains nylC enzyme is used to degrade nylon 6 samples3. 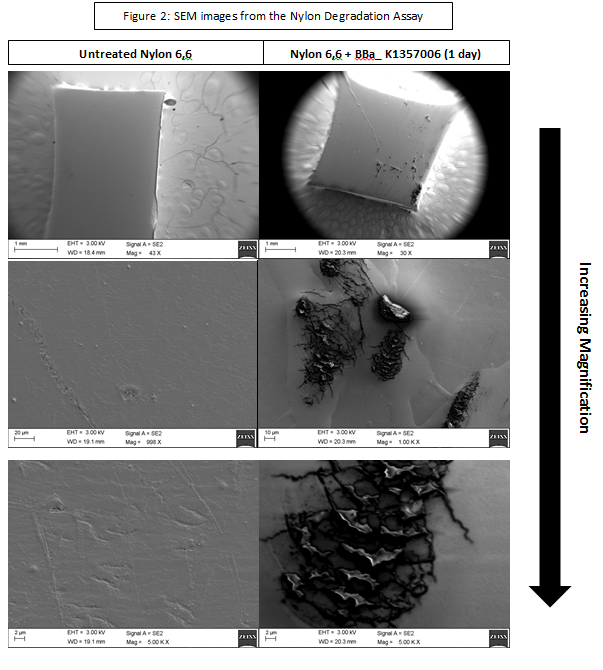 Mass difference of nylon samples before and after experiment are determined and the nylon is imaged using scanning electron microscope (SEM). In addition, trinitrobenzene sulfonic acid is used to test the production of primary amino groups in solution. The actual nylon we tested on in lab! Since nylC has its optimal activity at pH between 7.2-7.3, both the monobasic and dibasic of potassium phosphate (KH2PO4 and K2HPO4) are used to prepare buffer A1. The concentration of stock solution of buffer A is made to be 100mM potassium phosphate (KH2PO4 and K2HPO4) and 10% glycerol. The pH used in experiment was 7.23. Lysis buffer is required to disrupt bacterial cells. 1M Tris-HCl (pH=7.5), 1M DTT, 100mM PMSF are prepared as stock solution beforehand. The DTT and PMSF are aliquoted and stored in -20 degree freezer. The working solution of lysis buffer contains 50mM PMSF, 5% glycerol and 1mM DTT. Culture BL-21 (DE3) E. coli containing nylC Biobrick in 200-300mL liquid LB (with 20 μg/mL chloramphenicol) for 20 hours in 37 degree incubator. After centrifugation, resuspend every 1 gram of cell pellet with 1 mL of chilled lysis buffer. Then add 10μL PMSF (100mM) for every 1 mL of cell suspension. Add lysosyme into the suspension to reach the final concentration 1mg/mL and incubate the cell suspension at 4 degrees Celsius for 4 hours. Add 5 μL MgCl2 (1M) and 1μL DNase (1mg/1mL) for every 1mL of cell suspension and incubate the solution at 4 degrees Celsius for 30 mins. After centrifugation, recover the supernatant (lysate) and evenly distribute into three ependorf tubes. Discard the cell pellet. Add equivalent volume of Milli-Q water into two of the three tubes so the concentration of lysate halves. For the remaining one tube, add equivalent volume of buffer A to halve the concentration of lysate. Set up another eppendorf tube and add Milli-Q water into it so that it has same final volume of solution as the other three tubes. Cut thin nylon 6 ropes into three small pieces and weigh each on mass balance. Carefully use a tweezer to immerse each of the three nylon pieces into three tubes containing Milli-Q water (control), lysate+Milli-Q water and lysate+buffer A. One of the four tubes does not contain a nylon 6 sample (control). Incubate all four tubes in 30 degree incubator for 20 hours. Take out nylon pieces, wash with Milli-Q water and let it dry overnight. Use the same mass balance to weight the mass of three nylon piece again. Then image the three nylon samples using scanning electron microscope (SEM). For the four reaction tubes, the concentration of primary amino groups in each is determined by trinitrobenzene sulfonic acid method 2. The cell lysis part of this procedure is adapted from website of European Molecular Biology Laboratory 4. We are still working on modifying the functional assay of nylC. The procedure presented above is the most recent one we used in the experiment. There is no significant mass difference before and after treating nylon samples with lysate containing nylC. The SEM images show that there is no significant difference between the reaction group and control group. We propose two reasons to explain the results for both mass difference test and SEM imaging. We suspect that due to inappropriate experimental procedures, such as leaving lysis samples at 4 degree fridge overnight and conducting experiment at room temperature instead of at 0-4 degree, activated protease degrades a significant amount of nylC enzyme. We will carefully conduct the experiment under low temperature and figure out a more effective way to inhibit protease activity. We also suspect that the degradation effect of nylC activity is not reflected in both the mass difference test and SEM imaging. The mass is measured inaccurately because our mass balance had a maximum sensitivity of 1mg while the procedure required a resolution of 0.1 mg. In addition, the nylC may have its degradation effect on the two edges of the nylon strip instead on surface. We will perform trinitrobenzene sulfonic acid assay next to verify whether there is a positive change in the concentration of primary amino groups in solution, thus examine the degradation effect of nylC. Building upon the work of the Uppsala iGEM team, we developed a series of reporter constructs based on the chromoprotein parts developed by Uppsala. Uppsala made a wide array of chromogenic proteins available over the course of several years. They registered a vast array of parts, including coding sequences and coding sequences with attached ribosomal binding sites. We wanted to pick up where Uppsala left off and create a simple one step reporter BioBrick unit. 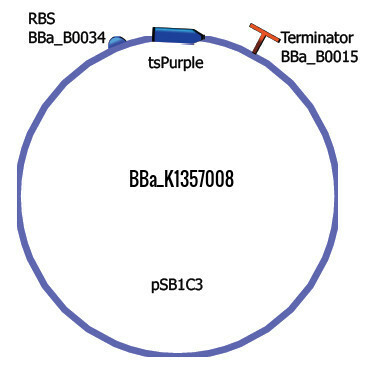 We combined the generic, high-affinity ribosome binding site, BBa_B0034, a standard double-terminator, BBa_B0015, and the coding sequences for a purple (tsPurple), blue (amilCP), and red (mRFP) chromoprotein. Our Human Practices teams considered the ethical implications of our project at the local, regional and international levels. 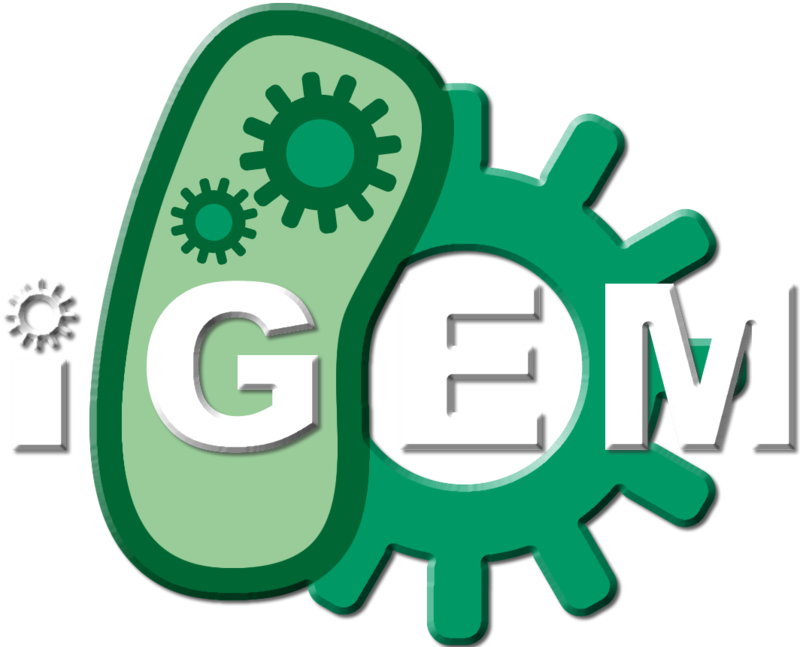 Utilized an international survey to collaborate with iGEM teams across the globe in order to gauge public understanding and acceptance of synthetic biology.